Palisades Toys' new in-house line of Crittaz are cool for many reasons: their design, their size, their price, their basic idea... but probably best of all is their packaging. The background is a simple blue brick pattern that makes the figures stand out nicely. And, you know, all credit to the graphic design team, but that's not what makes the package worth mentioning. No, it's a different change; instead of those stupid clamshells, the Crittaz come on a nice, simple blister card. Finally! The trend toward clamshells is still one of the worst things in the industry today - you shouldn't need a tool to play with your toys. The most sizeable figure in Crittaz Series 1 is the big brown elephant, TuTusk. Tear him out of the blister (it's easy to do) and you'll find a very nice figure. If TuTusk is lumbering down the street, nobody dares to get in his way. By far the largest inhabitant of Kingdom City, he is also the one who has the least amount of friends. A coward by nature, the truth is that he would rather back down from any fight than hurt anyone, but his massive size has resulted in a reputation that no one is willing to challenge. It also means that very few even want to know him. What they don't know is that he is more afraid of them than they are of him. Poor, lonely TuTusk. Don't you feel sorry for him? Buy him and be his friend. The Crittaz line has a great idea: anthropomorphic animals done in an urban vinyl style. 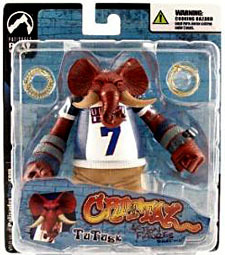 TuTusk's wearing a blue and white sports jersey (number 7) and a pair of khaki shorts. 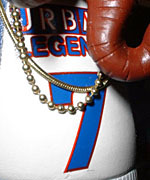 To help him look urban, he's got three sweatbands on his right arm and two sweatbands and a watch on his left. That is mad fat dope and poppin' fresh! Plan-B did the sculpt on these figures, and TuTusk really looks great. His brown skin is detailed and wrinkly, looking just like elephant skin should. The various textures used for his clothes are just as realistic. His cartoony head has little squinty eyes set deep below big furrowed brows, and his tusks are detailed with tiny ridges and cracks. 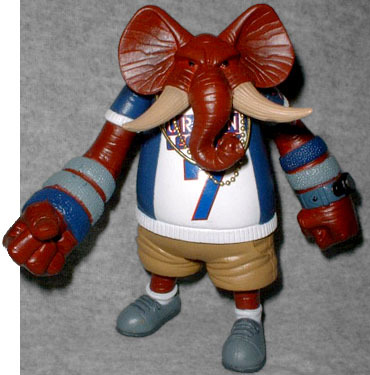 TuTusk looks great. 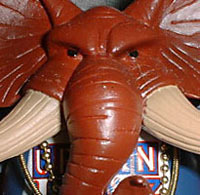 Incidentally, do you think that's "Tuh-tusk" like he has a stutter or "Too-tusk" like Tupac? If TuTusk was killed (for his ivory, no doubt) outside a night club, would the conspiracy theorist nuts come out of the woodwork claiming he was still alive? Or if he pronounced his name in elementary school, would the teacher send him to see the speech therapist? The figure's paint apps are good, with little noticable overspray. It would have been easy to get drops or splotches on the bright whites of his shirt, or to miss a patch of brown between the blue wristbands, but that didn't happen here. The logos on his shirt are crisp, and even all the details on his watch strap are colored as they should be. Woulda been good if the watch face got some hands, though. TuTusk is rocking the bling with two different necklaces: one a ball chain and the other smooth. Both can be put on the figure without having to open them - just put the necklace under the trunk, over one ear and then the other. The necklaces hang to the middle of his torso. TuTusk stands 4⅞" tall and moves at the Springfield Four: arms, neck and waist. That's not a lot of movement, but the figures only cost about half as much as most Palisades toys - $5.99. If that's the tradeoff, so be it. The Crittaz line has a lot more plusses than negatives, both in and out of the packaging.